This has been as shopping month for me, I bought aÂ Platonic Backbeat stereo bluetooth and Eye-Fi card from amazon, the shipping seems to be alot higher that expected but yet it still cheaper. A trip to Bintan with love. It’s my most memorable trip and been very happy with the nice decorated room and time with my most love one. I made my first trip to Singapore Zoo after been in Singapore for 4 years, it was raining heavily during this trip yet it enjoyable and we managed to hit all the mainÂ attraction. This is also the month we got united again with my ex cousemate. This year, we made tour to Kota Kinabalu, Sabah. Surprisingly, September has been quite month for me. Apart from attending Joyce friend wedding in KL, there arent much things does this month. Ah, remember this, I head over to Desaru, Johor with ex-colleague. Got the change to go back to days when I was small playing with the water slides. That a trip back to Penang, where I bring my most loved person to “The Ship” for dinner. May was the month for Indonesia, I visited 2 places in Indonesia. A trip to Batam and Bandung. I cant remember how many times i been to batam so lets just skip that. Bandung is been as shopping heaven for girl. You can go just buy and buy cause thing there is so cheap. But the hotel is expensive though. It’s another year I celebrate my birthday in Thailand. Also the first time, I hug other girlÂ in frontÂ of my GF. Ops.. lets notÂ elaborateÂ further. I had a early celebration at on of the high class restaurant. First time fine dining. Got a pretty dress for my BB. So what is Eye-Fi card. It is a SD card.. haha… but with WIFI capability[Don’t confuse with SD-IO card]. Eye-Fi is been designed to transfer the file over the wifi to your pc. For examples, you come back from photo shooting and you need to take your card from camera and plug to your pc card reader, copy the file and put it back to your camera. Oh most of the time you forgot put it back to your camera and next time go out with big camera without card inside. 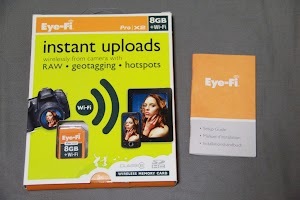 Here come Eye-Fi card to the rescue, you come back from photo shooting and all you need to do it enable the Eye-Fi. All the files magically appear in your computer. Easy right. You will need to setup your WiFi prior to that. So here i got mine and configure up and running. One of the most advantage of this is the unlimited space capabilities. It can continuously uploading while you continue shooting, I notice the upload stop when your camera saving the file then it continues. It took about 2-3 sec to upload a 18 mega pixel jpeg file on the Wifi 802.11n network. I still have not get this tested on actual usage. My friend comment that this is draining lots of camera battery even when you turn it off. Well, I will test it out this Eye-Fi card this Chinese New Yaer in Malaysia.